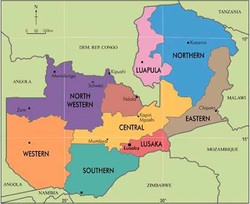 Central, Copperbelt, Eastern, Luapula, Lusaka, Northern, Muchinga*, North-Western, Southern and Western. These provinces are further divided into 72 total districts. Zambia's resources can be identified by district. The Zambian government is establishing economic clusters in its districts. These clusters will capitalize on the districts products and resources in order to support Small and Medium Enterprises (SMEs). Such clusters will create the establishment of supportive infrastructure which will in turn fuel the development of the district, the province and consequently, the country. * Muchinga Province was recently formed in 2011 and is not represented on the map above. Muchinga Province borders Northern Province. Breeding, fattening, red meat processing, leather processing, by-product utilization, abattoir, butchery, transportation, marketing, etc. Breeding, Artificial Insemination, milk production, animal disease control, feed, transportation, cooling and storage and transportations systems, milk processing and packaging, marketing, by-product utilization, etc. Hatchery, nursery, fish farming, input and drug supplies, capture fishing, cold storage, transportation, processing, marketing, etc. Grafting services, nursery business, input supply, storage, transportation, fruit chunks, pulp, juice, jam, pulp, marketing, by-product utilization, etc. Mining, grading, processing, dressing, marketing, etc. Input supply, aflatoxin control, storage, processing, marketing, etc. Production, bulking, processing, beeswax, apropolis, by-product utilization, marketing, etc. Edible oil, cosmetics, soap, fuel, transportation, marketing, etc. Input supply, fruit chunks, juice, jam, pulp, storage, transportation, marketing, by-product utilization, etc. Meat and egg production, day-old chick supply, meat processing, marketing, by-product utilization, etc. Input supply, tilling, storage, transportation, grading, processing, marketing, by-product utilization, etc. Production, storage, transportation, marketing., by-product utilization, etc. Green projects, carbon trading, harvesting, transportation, processing, marketing, by-product utilization, etc.